I've mentioned many times that J is an avid chewer, frequently chewing through what are supposedly the toughest chew necklaces in just a matter of hours or days. We've definitely tried a variety of chewies and necklaces over the years, so, at this point, I feel like we are experts on chewelry. I also get asked all the time for suggestions on the best chew options for oral motor sensory seekers, like J. 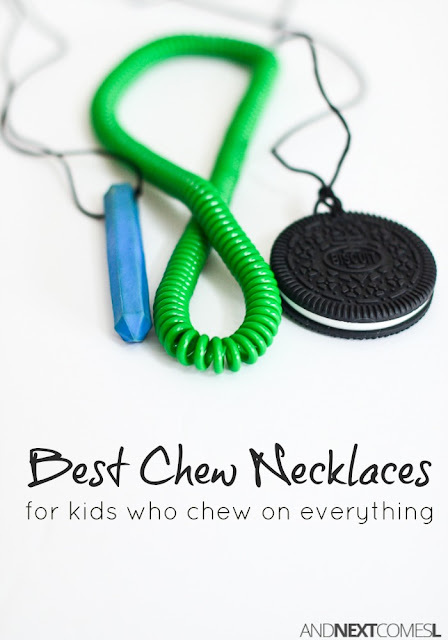 So here are our top picks and favorites for the best chew necklaces for kids who chew on everything. 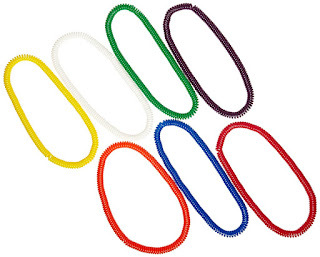 The chew necklaces on this list are ones that we have personally tested, have lasted more than a minimum of three months, and have passed the chew destruction test by J. We have declared these options the most durable chew necklaces for our house and as we discover new brands and styles that meet our needs, I will add them to this list. So in no particular order, here are our top rated, most durable chew necklaces and chew toys. One reason I love this set of necklaces is because of the price. They are so affordable! I also love that they don't have clasps because, let me be honest, J ends up chewing on clasps and breaking them all the time. But the main reason I love these necklaces for J is that they are indestructible. They show no wear and seem next to impossible to chew through. J has been gnawing on these necklaces for well over a year and they have stood up to his avid chewing. Now for the downsides...They are not good for kids with long hair. Hair can easily get tangled in them. Not a problem for us since J has super short hair. The other negative is that J spends a lot of time fidgeting and playing with these necklaces while he chews on them. He stretches them around his body. Not a huge issue, except for when he is sitting on, say, the school gym floor during assemblies and the necklace is constantly touching the floor. Gross, right? But as long as this necklace stays around his neck or in his mouth, we have had no issues with these necklaces. This chew necklace has lasted forever at our house! 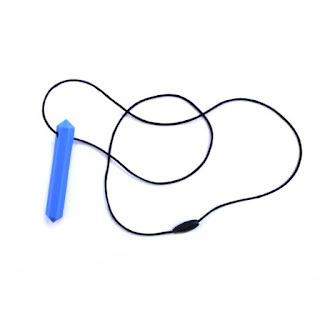 There is no texture to this necklace and the long narrow shape of it is perfect for kids who like to really chew with their back molars. I love that ARK's chew necklaces come in a variety of toughness levels, so if you have an extremely avid chewer like I do, then you will definitely want to purchase the extra extra tough version. 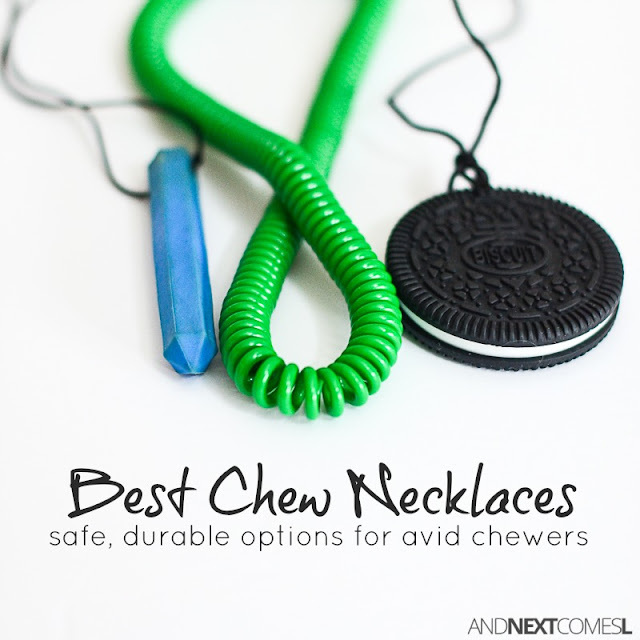 I don't, however, recommend the textured chew necklaces for avid chewers. They did not hold up at all for us, but the plain, smooth ones are definitely fantastic! We have multiple colors of these cookie chewies and I must admit that I was hesitant at first about them. They are bulky, so definitely not discreet. However, I was more concerned about the texture of these cookies since J, in the past, has chewed textured bits off some of the extra extra tough chewies in less than 24 hours. So the fact that J hasn't destroyed any of these cookies in the almost 12 months that we've had them is astounding. And we have like four of them! 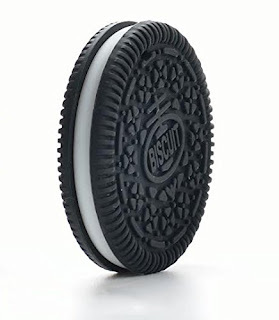 The white band around the cookie (the cookie's stuffing) does get pulled off all the time. J hasn't chewed through it yet, but if anything were to get broken on this chew, it would be that part first. However, it could easily be removed if you think your child may chew right through it. Our favorite cookie chew necklaces are from Canadian DIY Supply. You can read more about why I love their silicone beads and chewies here.